After 244 years, the company behind the Encyclopaedia Britannica will stop producing its print edition in order to focus its efforts on its digital version and on other educational tools and products. After a peak in sales in 1990, the advance in the use of Internet, and most recently of Wikipedia, were reasons why people lost their interest in acquiring a printed edition of the encyclopedia. Furthermore, since 1994 there is an online version of the Britannica, and currently customers can also buy it in a DVD. At this moment, while 15 percent of Britannica's total revenue comes from the online version of its encyclopedia, only 1 percent comes from the print edition. Educational tools and curriculum products, on the other hand, account for the remaining 84 percent. The price and weight were important factors for the ending of the print edition. 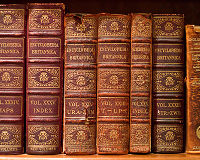 While the online subscription to the encyclopedia has a $70 annual fee, and the DVD can be acquired for $36, the last printed version, the 2010 edition of the Britannica composed of 32 volumes, has a price of almost $1,400. There are still 4,000 sets available at that price. By Rom Cartridge. Image courtesy of Joi Ito via Flickr.